NEWS ANALYSIS: Norway’s Jens Stoltenberg has always been known as a likeable guy, from his years as a radical young politician through his three terms as Norway’s prime minister. Now, as secretary general of NATO, the man Norwegians still refer to simply as “Yens” has also managed to charm US President Donald Trump and thus retain the US’ important commitment to the western world’s leading defense alliance. Stoltenberg nodded and smiled through all of Trump’s self-congratulatory remarks, also later at a photo session inside the White House. 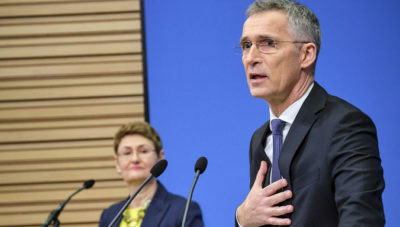 Through a mix of flattery and substance, Stoltenberg appears to have won over the unpredictable Trump who was harshly critical of NATO and even threatened to withdraw from it if Canada and other European allies didn’t start “sharing more of the burden,” as Stoltenberg puts it. It should be noted that Trump wasn’t the only one who had a say, or who wanted Stoltenberg to stay on after his first term on the job was about to end. Now Stoltenberg’s term has been extended again, to a total of eight full years. Even though Trump continues to grump that countries like Germany (and Stoltenberg’s own native Norway) haven’t met NATO’s defense spending goals, it was German Chancellor Angela Trump and Trump’s predecessor Barack Obama who originally recruited Stoltenberg for the job. 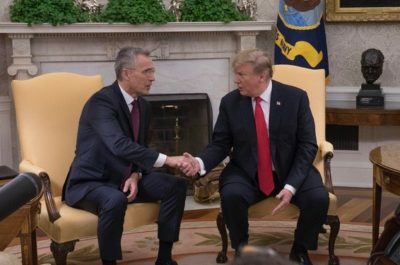 Through a mixture of flattery and praise, Stoltenberg has managed to placate Trump in a professional manner and extract the support that NATO needs. He doesn’t mind letting Trump take credit or throw his weight around, as long as the alliance stays together and stays strong. Stoltenberg has enough self-confidence that he’s never needed to do all the bragging that some other leaders do, or have his ego massaged. Stoltenberg has also built bridges between Europe and the US since Trump was elected. Some experts have claimed that Stoltenberg has had a “considerable” influence on Trump. While he’s caught some criticism for praising Trump’s leadership at times, others note he hasn’t had much choice. NATO’s leader must have a good relationship with whoever is president of the United States. Stoltenberg said that he and Trump would be discussing “how to make this summit a success, showing that Europe and North America are standing together, and we will continue to focus on defense spending because, as the president says, NATO allies have to invest more in defense and that’s exactly what they’re doing.” Stoltenberg also noted that the allies are making progress on burden sharing. Stoltenberg also stresses that Americans must understand that the US needs NATO, too. It’s in the US’ own interests that NATO remains strong, he says, telling Aftenposten this week that “the balance of power is fundamental. New technology is creating new forms of warfare and new threats. Not even the US can tackle that alone.” NATO now also needs to worry not only about Russia, but also China, which has been muscling its way into the Arctic and laying claim to the South China Sea. Its buzzing of Taiwan’s airspace this week was viewed as a direct provocation. NATO is, in many ways, the glue that ties the western world together, according to Norwegian commentator Nils Morten Udgaard. “We all need NATO,” claimed Norway’s foreign minister, Ine Eriksen Søreide, in a commentary in newspaper Dagens Næringsliv (DN) on Wednesday. As one of NATO’s founding 11 members, the alliance has long been the foundation of Norway’s own defense. European allies and Canada are expected to add USD 100 billion more to their defense budgets by 2020. The foreign ministers of all 29 NATO members are meeting in Washington DC as well this week, and ready to celebrate the 70th anniversary of their alliance despite some conflicts among themselves. The US and Turkey are in a conflict over Turkey’s defense purchases from Russia, for example, prompting the Trump Administration to disrupt Turkey’s large order for F35 fighter jets. Italy is in ongoing conflict with other EU members over immigration issues and debt issues, while Brexit is rattling alliance members along with much of the rest of the world. Stoltenberg was dealing with it all while also poised to become the first Scandinavian ever to address the US Congress during his visit. Only 115 people in the US’ history have ever address a joint session of Congress and Stoltenberg posted a photo of himself “putting the final touches” on his address as he flew to Washington. “In an unpredictable world, we need our Alliance more than ever,” Stoltenberg wrote. Many Norwegians would proudly add that the world needs more people like Jens as well, and he’ll be celebrating back home with old colleagues this weekend. Stoltenberg turned 60 last month, and the Labour Party he led for many years will honour him at its annual national meeting this weekend in Oslo. Stoltenberg can expect some conflicts there as well, since some Labour Party members want to back the international campaign against nuclear weapons and NATO can’t go along with that. Knowing Jens, he’ll convince them of the importance of maintaining nuclear strength or find some other solution, and they’ll all part as friends.